5 day itinerary for Pondicherry! The idyllic town of Pondicherry is a locale of cultures and ideas. The local Tamil culture, French colonial past and home to an experimental community of people professing integral living, it breeds creativity and exudes the virtues of peaceful coexistence. It is reminiscent of the bygone era of the French colonialists, yet it is so refreshingly modern in its outlook. The French style avenues, the gorgeous beaches where you can laze around all day, the churches, the temples and the poetically named streets make Pondicherry a perfect place to vacation. I love to curate experiences and I think the following 5-day itinerary for Pondicherry would be perfect. But before we start, let me remind you that the first step to making any trip successful is to get travel insurance online. Arrive at Pondicherry and enjoy your breakfast at Bon Bake. Their Basil Tomato & Cheese Sandwich and hot chocolate are highly recommended! After a relaxing bath, head to Promenade Beach to laze around for a few hours. I recommend visiting the Pondicherry Museum, the Puducherry Botanical Gardens and the Light House. End your day with a romantic dinner sitting under the mango trees at La Maison Rose. It’s time to visit Auroville, the City of Dawn and participate in the ‘Explore Auroville with Ambre’ tour. They have a 1 day or a 3-day tour option. When hunger pangs get unbearable, do visit the Auroville famous for its hot croissants, baguettes and pastries. The Happy Food Restaurant & Market is perfect for lunch. Don’t forget to purchase their delicious homemade jams and syrups. Day 3: Let’s be a tourist! Spend your third day at Pondicherry exploring all the tourist spots. I recommend visiting the Pondicherry Museum, the Puducherry Botanical Gardens and the Light House. A boat ride at the Chunnambar Backwater resort is the perfect way to unwind and give your feet the much-needed rest after exploring Pondicherry for the entire day! No trip is complete without taking back something local that will make you remember the good days! I recommend three must-visit places! Janaki which is a project to promote conscious and sustainable living sells beautiful apparel, pottery, aromatherapy products, hair and skin care products. If you want to purchase some unique apparels from independent designers, do visit Casablanca on Mission street. People who love embroidery will fall in love with the exquisite handiwork of women at the Cluny Embroidery Centre. Ending your day at Kasha Ki Asha, an ethnic café, run by a group of women serving scrumptious food and funky postcards, magnets, souvenirs, clothes, slippers, home accessories, handmade soaps, and a lot of other artsy stuff. Pondicherry can get a wee bit expensive during the peak tourism season, so plan your trip accordingly. Auroville has some fabulous and affordable guesthouses for tourists. Book them in advance because they are nearly always full. This is a great way to save money. Pondicherry Tourism offers a full day tour city tour for just Rs. 300. Do try it out. Remember to enjoy the fresh seafood and the French cuisine along with some of their delicious wines! Research thoroughly, as there are many travel insurance companies out there before you insure your trip. Stay safe, have fun and soak in all the culture that Pondicherry has to offer! Fun! This looks like a fun & well-planned trip – love the food tips too! I would love to visit Pondicherry! 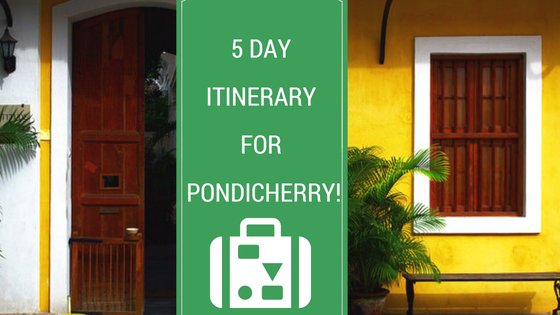 I’ve never heard of Pondicherry but now I have my itinerary set! Oh wow Pondicherry sounds incredible. I can imagine the amazing views and french cuisine. Ok the name itself makes me want to go to Pondicherry! It looks like a fun place to explore. I had never heard of Pondicherry but it sounds like somewhere that I should add to my list of destinations! I have always wanted to visit Pondicherry – it’s on my bucketlist and am collecting all the information I can about it. Hope to make it a reality one day! Sounds like a great guide! Thank you for the tips too. I will visit this beautiful place soon! Sounds like a place I need to visit asap!